Is to help others learn to work with draft horses, with increasing knowledge and sensitivity so that their enjoyment of and ability in working with horses can grow to encompass an increasing range of accomplishments. Is to provide ideas and examples of sustainable farming with horses and to create a setting and atmosphere that encourages anyone interested to get started with their own dreams. Are to work a farm that is environmentally, economically and personally sustainable. All parts of the farm compliment each other, recycling, supporting, nourishing and energizing. Draft horses play a key role. They cause less soil compaction, grow their own replacements, welcome you to the barn and forgive your mistakes. Our workshops will be helpful to anyone interested in using horses for farming, logging, pleasure driving, or pulling commercial horse drawn vehicles. They will also be useful for museum and living history farm operators and staff who want to use and understand horses and equipment in a farming context. Our driving workshops focus on building your skills & confidence in harnessing, hitching, driving & horse management. We use a single horse and teams for hands on experience and individual instruction. You will drive from the ground, on a wagon and a forecart. We cover horse management including the basics of safety, handling, foot care, feeding and horse health. We place a lot of emphasis on clear communication through effective use of the drivers hands and voice. Technical driving skill development is achieved with lots of time in the drivers’ seat and one- on- one instruction. Put your hands on the harness to learn about different styles, correct adjustment & fit. While we used to offer two levels of this workshop, we have been increasingly challenged by fluctuating demand for both levels. We now invite new and returning participants to choose the workshop that best meets their time needs and we will challenge you and expand your skills and understanding with each workshop that you take. We usually accept a maximum of 4 participants to provide for plenty of hands on time with close instructor supervision. Want to know more? 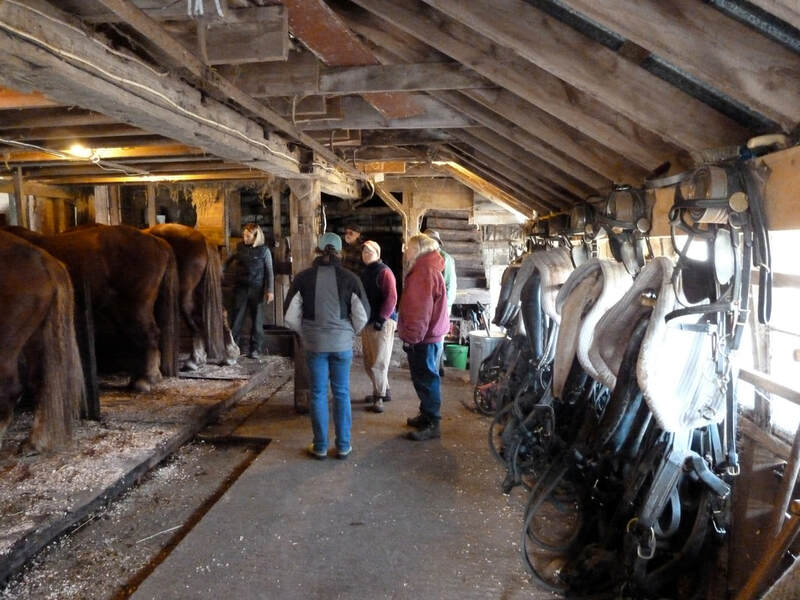 Text and photos describe A Typical Day At A Draft Horse Workshop. Intensive workshops are designed for working on the driving skills associated with the specific tasks that each one covers. Therefore, there is a prerequisite of one of our four-day driving workshops or instructor permission. If you want to use your horses to work in your garden or tilled field, this workshop is for you. We will be using a variety of equipment, including sulky plows and one- & two-horse cultivators. This is not a driving workshop. Sat April 20 here at Fair Winds Farm. We will cover line configurations, various ways of hitching 3 (and 4 if there is interest) and some of the considerations, safety and otherwise with the various set ups. Starting at 8 in the morning, going through lunch (provided) and finishing up at 5PM. Participants will be encouraged to hitch up and drive. Our goal is for participants to understand how the hitch works so they will be able to safely apply it to their own situation. This is not a learning how to drive workshop.